The Battle of Brooklyn not only spotlights the NEC’s fiercest rivalry, but almost without fail delivers some of the most compelling television when it is airs annually as part of the conference package. When the LIU Brooklyn – St. Francis Brooklyn rivalry is renewed on Saturday at the Pope Center (TV: MSG, FCS at 4 pm), there will be plenty of hype, and deservedly so. But can the game top these recent LIU-SFBK TV thrillers? 2014 – Contested for the first time at the Barclays Center, Jason Brickman finishes with 14 assists in a 69-68 win for the Blackbirds. It marked the sixth time in the last seven years that a televised game between the two teams was decided by four points or less. 2013 – LIU rallies from 14 down in the second half, scoring 57 points after intermission to win 78-68 at a packed Pope Center. 2012 – Julian Boyd hits the go-ahead jumper with 18 seconds left as the Blackbirds come back from five down with under three minutes to play and secure an 81-78 home win. 2011 – CJ Garner goes coast-to-coast and hits a runner at the buzzer to give LIU the 82-80 victory as pandemonium breaks out at the Pope Center. 2010 – In perhaps the most exciting game of the series in recent years, the Terriers take down the Blackbirds in triple overtime, 88-84. SFBK twice had to hit late three-pointers to force the second and third OTs. 2009 – SFBK rallies back from 15 down in the second half to tie it up, but the Blackbirds are able to salt the game away at the line, winning 74-70. 2008 – The Terriers win at the Steinberg Wellness Center, 67-64, when a Kyle Johnson three-point attempt is just off the mark with four seconds to play. 2006 – LIU erases a 14-point second half deficit and survives a last possession by SFBK to win at home, 67-64. 2003 – This one wasn’t televised, but went down as perhaps the most memorable contest in NEC history. LIU guard Antawn Dobie turned in the most brilliant single-game performance in league annals exploding for an NEC single-game record 53 points. But that wasn’t all. He also dished out 15 assists and was directly involved in 87 of LIU’s points that day. One would assume those numbers would guarantee a victory for the Blackbirds. Not on this night. Not in this rivalry. While Dobie was putting on a one-man show, the Terriers received stellar performances from a pair of Brooklyn products. Freshman sharpshooter John Quintana (Lincoln) came off the bench to register a career-high 31 points and senior forward Clifford Strong (Bishop Loughlin) added 29 points. Likewise, future All-NEC point guard Tory Cavalieri dished for 13 assists. Carrying the Blackbirds on his back, Dobie played the role of hero on more than one occasion. His 40-foot runner as time expired forced overtime and sent the evenly split crowd into a frenzy. His two free throws at the end of the first extra session sent the game into double overtime. Dobie then scored five of his team’s 11 points in the second overtime. One would think destiny would be on Dobie’s side as the game reached its final climax, but his potential game-winning 17-foot jumper went in and out with five seconds to play and the Blackbirds trailing by one. It was one of the very few shots Dobie missed on the day. In the end, St. Francis (NY) won the Battle of Brooklyn that year. The score: 142-140. To this day, it remains the highest scoring game in NEC history. 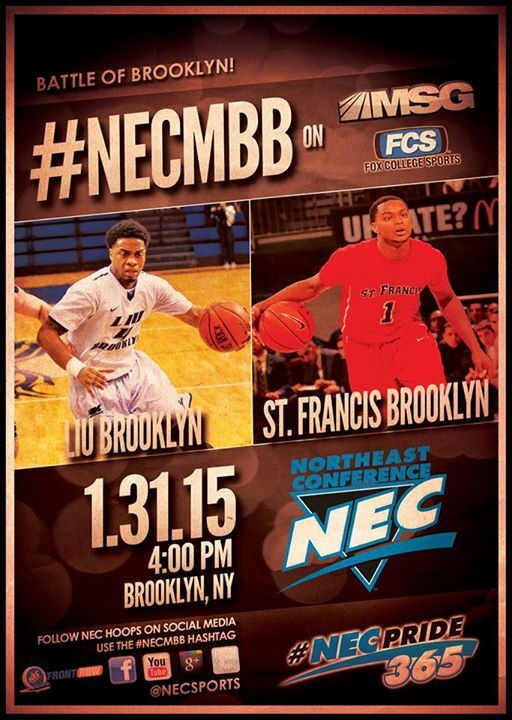 No single team has ever scored that many points in an NEC game before or since. So what will Saturday bring? If recent history is any indication, the answer is clear.